One type of decay in the subatomic realm occurs when an existing object simply fissions into two smaller objects. In this case, the makeup of the initial particle and decay products are just moved around, as when a column breaks into pieces. One example is when a uranium nucleus breaks into thorium and helium nuclei. Decay evokes a lot of images, from jumbled piles of stone that once composed breathtaking examples of architecture to the dank smell of a damp forest glen, with the rot of wet leaves and crumbling tree stumps filling your lungs. The word decay also shows up a lot in Fermilab Today articles, which often talk about the decay of this particle or that. Is it possible that you, the reader, might be applying a common meaning to this most uncommon situation? Just what does this familiar word mean in a particle physics context? In particle physics, decay means that a particular particle disappears and is replaced by two or more so-called decay products. Conjuring up a human metaphor, we call the initial particle a mother particle and the decay products the daughter particles. The daughter particles can in turn decay into granddaughter particles and so on until you get the final product. So let’s talk about the decay of subatomic particles. There are three broad classes. We’ll start with the easier ones and work our way up to the more mind-bending ones. The first is a class of nuclear decay. In familiar cases of decay, the final products are already in the parent. For instance, in the ancient Greek city of Ephesus, broken marble columns litter the ground. These pieces of columns were once stacked to make a magnificent colonnade, an architectural paean to the gods or the leaders of the city. The broken bits of columns are not new, just in a different form, like shards of glass from a broken goblet. Similarly, there are nuclear decays in which the components of the atomic nucleus are just rearranged. The simplest is called alpha decay. Alpha particles consist of two protons and two neutrons. In an alpha decay, a heavy element spontaneously fissions into two lighter particles, one of which is an alpha particle. For example, a uranium atom (with 92 protons, 146 neutrons) can decay into a thorium atom (with 90 protons, 144 neutrons) and an alpha particle (2 protons, 2 neutrons). 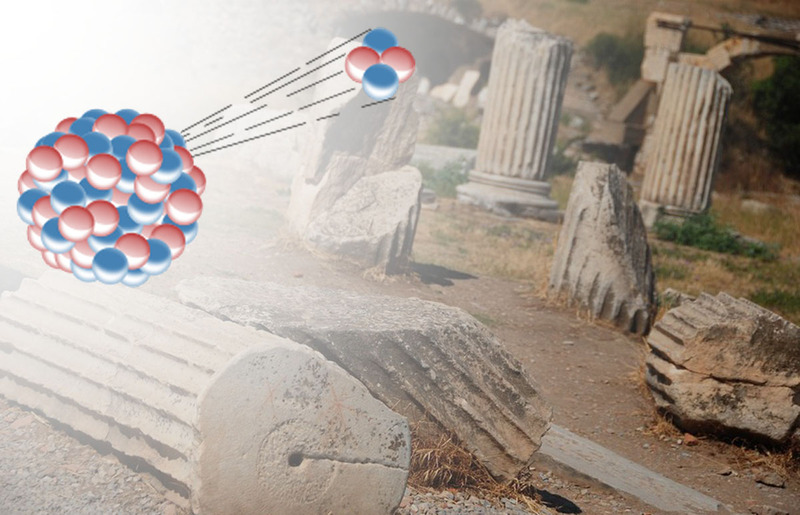 This is a case of the existing protons and neutrons simply moving around, just like the pile of rocks that once made up a Grecian column. A second type of decay involves the transmutation of components that already exist. 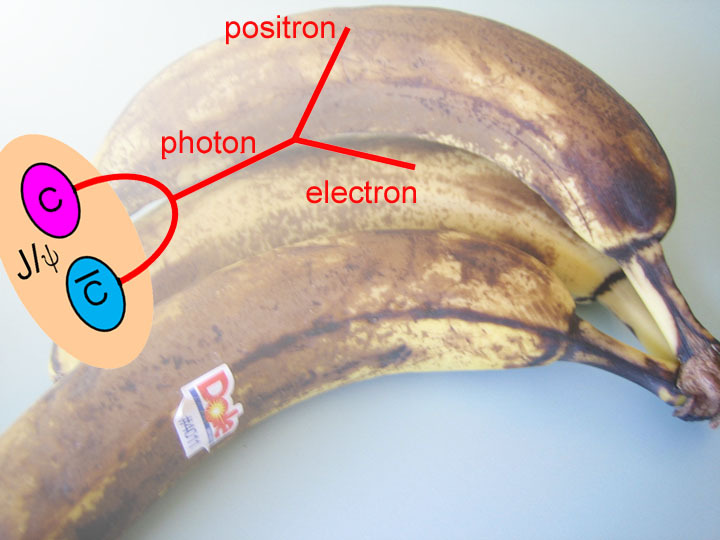 Just as the starches in a banana will convert first into sugars and eventually into inedible substances, a particle such as the J/ψ meson can take its component quarks and antiquarks and combine them into something else. In this case, they annihilate and form a photon, which eventually becomes an electron-positron pair. The most mind-blowing kind of subatomic decay occurs in decay processes involving the weak force. In this sort of decay, the mother particle simply disappears and is replaced by two daughter particles. 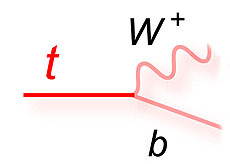 One example is a top quark decaying into a bottom quark and a W boson. A second kind of decay involves transmutation. In the ripening and subsequent decay of fruit, the starch becomes converted to sugar, which makes it sweet. The sugar subsequently converts to glucose (a less sweet form of sugar), which converts, in turn, to other carbohydrates. This last stage is when the fruit begins to rot. The atoms in the fruit don’t change but rather become associated in different ways. There are comparable changes in particle physics, in which the components of a parent particle combine to create daughter particles that seem quite different from the parent. Consider the J/ψ particle, which consists of a charm quark and a charm antiquark. This particle decays rapidly (in about 10-20 seconds) into an electron-positron pair. (It can also decay into a muon-antimuon pair and in other ways.) Note that the mother J/ψ particle does not contain an electron or positron inside it. Those daughter particles are created in the decay process: The charm quark and antiquark components annihilate each other, temporarily converting into a photon, which then converts into an electron and a positron. The third and oddest kind of decay in particle physics is governed by the weak nuclear force. This type of decay really has no classical analog. In it, the identity of the parent is changed. Straining an analogy, it’s like a dog emitting a force particle and becoming a cat. A more realistic particle example is that of a top quark emitting a weak-force-transmitting W boson and becoming a bottom quark. 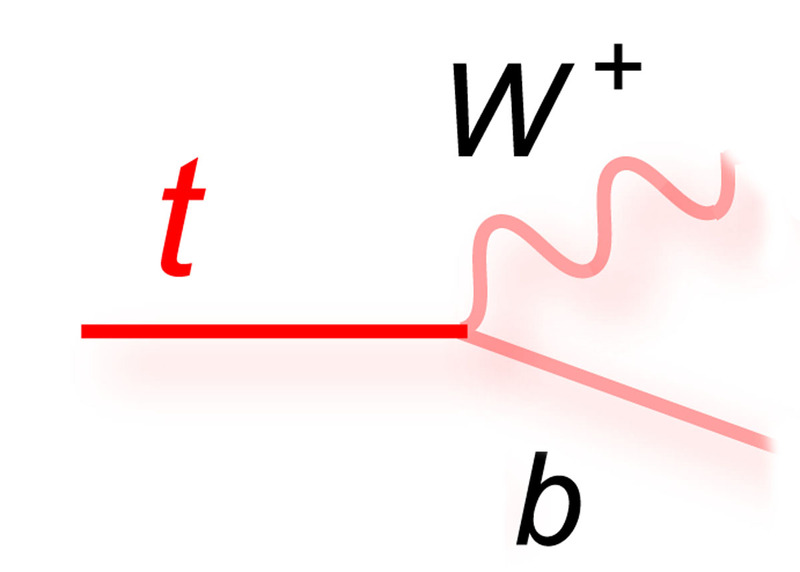 When we talk about a top quark decaying into a bottom, what we really mean is that the top quark disappears and in its place appear a bottom quark and W boson. Thus we see that in the particle world decay can have many meanings, from something big breaking into two smaller objects, to cases where components of the mother particle combine to produce daughter particles, to the very weird case where a mother particle simply spontaneously converts into daughters that didn’t exist prior to the decay. When you read about particle decay in Fermilab Today, it is most often decays of the third type that physicists mean.